Turmeric is known for its peppery, warming and bitter flavor and mildly pleasant scent that resembles orange and ginger. It is one of the basic ingredients in curry powder, and it also adds a bright yellowish note to ballpark mustard. Turmeric is obtained from the root of Curcuma longa. It is characterized with tough brown skin and deep orange meat. In Chinese and Indian traditional medicine branches it is praised for its strong anti-inflammatory potential. Turmeric is also known as ‘Indian saffron,’ mostly due to its rich color. Researchers have revealed over 600 benefits of turmeric, regarding its preventative and therapeutic potential. Given that it is a strong anti-inflammatory, turmeric is a safer and more effective alternative to ibuprofen. Most medical experts agree on this one. The purpose of this article is to help you grow 100% natural turmeric in your home garden. Grow it to add an exotic note to your home. That is the benefit you get for free. You can grow it in your garden as well, of course, if the place you live in has a warmer climate. In this article we will focus on growing turmeric indoors. Similar to ginger, turmeric grows from rhizomes. If by any chance you did not know it, rhizomes are pretty similar to roots. 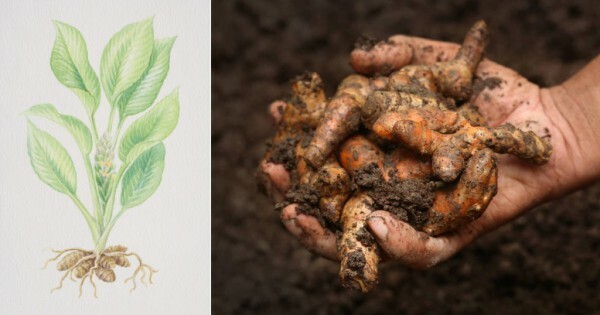 Turmeric does not give seeds, and rhizomes are the only way to cultivate it. But, the good thing is that rhizomes are pretty easy to plant. Turmeric rhizomes are not available in garden stores, but you can find some in Indian food stores or healthy food stores. Always look for firm rhizomes with lots of bumps. Each bump or bud will give a new plant. The next thing you need to do is find a fitting pot. Opt for varieties with good drainage holes. Make sure it is at least 14 inches by 14 inches. Turmeric is nothing like your fragile herbs. Fill the pot with high-quality potting soil, preferably an inch below the rim. If your rhizome is larger, split it into small pieces with 2-3 bumps. Plant it 2 inches deep inside the soul with, bud side up. Water the soil, and you are done! Turmeric enjoys plenty of water, so make sure you always keep the soil moist, especially if you live in a hot and dry area. Water the pot every 2 days. You can also use a spray bottle, if you find it easier. If the climate you live in is slightly cooler, water your turmeric plant less frequently. The only thing you should remember is that the soil should never be soggy. Turmeric is not as generous as your leafy herbs. It requires 8-10 months of proper care before you even get to harvest it. The plant shall turn yellow, and you should also notice that the leaves have dried out. Your turmeric is ready to harvest. Uncover the plant and cut the rhizomes off the stem. Wash them well, and your turmeric is ready for use. Take a piece or two of the root and plant new rhizomes. If you cultivate your turmeric with care and love, you should harvest several root pieces without taking the entire plant out. When it comes to using your turmeric, consider peeling the root first. Always have your gloves on, because it can easily stain your hands, and the yellow stains shall remain on your skin for several days. Keep unpeeled turmeric roots in air-tight containers. Store it in a cool and dark place. You can keep your turmeric like this for half a year. Drying turmeric roots is not an easy job, so do not try to do so. Use the roots fresh, and you can either slice or mince them. If you have used dried turmeric in your cooking, be especially careful when switching to fresh produce. Fresh ginger has a stronger taste, and even a tiny bit goes a long way. Add small amounts of turmeric to your meals, and enjoy its peppery flavor. Next post: 5 Foods That Kill Cancer And Help The Body Destroy Tumors Without Any Drugs! Previous post: Are You Agree With That The Best and Worst Foods for Type 2 Diabetes…? ?